I have a GPRS connection over T-Mobile basically working on my FreeRunner using the Qtopia software. 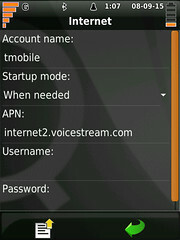 It isn't yet working for dialing over bluetooth though, to use the phone as a modem for my laptop. I hope to figure that part out soon. Things are a little erratic — sometimes I have to try an extra time or two before it will connect to the network. First, go to Main > Settings > Internet. From the menu icon, select New and then GPRS. Then do the Account settings. Account name is whatever you want. The APN should be internet2.voicestream.com. I leave "Startup mode" on "When needed", but this does not yet seem to have the desired effect of connecting on demand when sending an e-mail or what not. Username and Password should be blank. 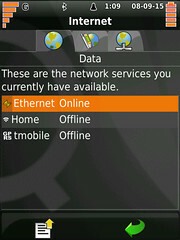 In Network Settings, I have "Timeout" unchecked, and "Auto name server" checked. Maybe I shouldn't have "Timeout" unchecked. I don't really know. Under Advanced, I have "Auto Routing" checked, and Hardware checked under "Flow ctrl". "Wait time" is set to 15s. Now, ssh into the device. A patch is needed to /opt/Qtopia/bin/ppp-network to get these settings right when going through the GUI, but until then, here's what I did. I removed /etc/ppp/resolv.conf and symlinked it to /var/run/ppp/resolv.conf, which is the file that actually seems to get updated on ppp connect. /home/root/Applications/Network/chat: This is the chatscript created by the GUI. I imagine that fiddling with this might make starting the connection more reliable. Various /etc/ppp/peers/dialup* files are created by the GUI, and those contain the ppp settings.